Avon, Indiana is located in Hendricks County, some five miles from Indianapolis. Settled in 1830 by early settlers, the town was originally named Hampton. After several name changes, it became Avon in 1870. Originally an agricultural community, with the continued development of businesses and addition of schools, Avon grew. However, it was not incorporated until 1995. It has a population of approximately 17,000. This beautiful area is the home of Avon Perennial Gardens. Besides being able to wander through the beautiful flowers and plants, there are also candlelight dinners and live concerts. Those who like some outdoor activity will enjoy Monster Min-Golf. It is an 18-hole miniature golf course that glows in the dark and has monsters. It also houses an arcade and deejay. The Prestwick Country Club is just outside of Avon. It is a private country club and offers not only golf but tennis. It also hosts weddings and other social events. The Haunted Bridge of Avon is just one of many haunted locations in Indiana. The bridge has many tales of ghosts and whispering in the dark. It was formerly the crossroads for the Big Four Railroad, but now that the bridge is no longer used, it is perfect for specters to relive past glories. Avid shoppers will be happy with Avon Commons. It is a newer mall that offers many dining places and well-known stores. Real estate in this growing area includes starter homes to estates. Single-family homes include traditional brick ranches and bungalows, as well as the more modern European style estates. You’ll find lovely lawns and mature trees in both the older neighborhoods and the newer developments. There are lots available for you to build, and there are homes on acreage for a more country style living. There is plenty of local shopping and business to take care of everyday needs. There are many fun things in this family-friendly town, with low crime and excellent schools. 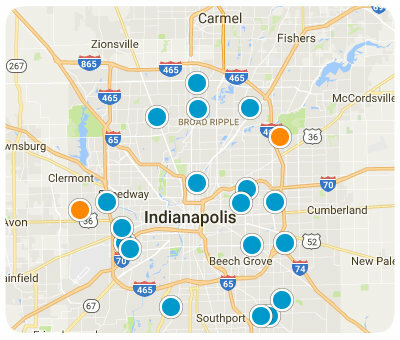 When you consider all of this with the proximity to Indianapolis, then you have a must-consider destination for home buyers in the Indianapolis area. If you would like more information on homes for sale in Avon, Indiana, please contact us today and allow us to assist you. Listing courtesy of Wynkoop Brokerage Firm, Llc. Listing courtesy of Edge Realty Group, Inc.